McWane Ductile Ohio Sponsors Ice Carving Festival | McWane, Inc.
McWane Ductile Ohio was proud to be a sponsor in the Ice Carving Festival held last week in Coshocton, Ohio. The event is coordinated by the non-profit organization Our Town Coshocton and is in its second year. In addition to the ice carving, there is also a chili cook-off, horse-drawn carriage rides, live music, and lots of good food. Other than the concessions, the event is free and all of the activities are within walking distance around the courthouse. The ice sculpture themes are chosen by the local sponsoring businesses and is an event that the entire family can enjoy. But no event would be complete without prizes! This year the top two local ice carvers received prizes of $200 and $100. The top three winners in the chili cook-off received prices of $300, $200, and $100. Of course chili samples were free to visitors, but they could pay a dollar to cast a vote for their favorite cook. As you can see from the picture, these are really talented ice carvers and we commend them on their incredible talent! 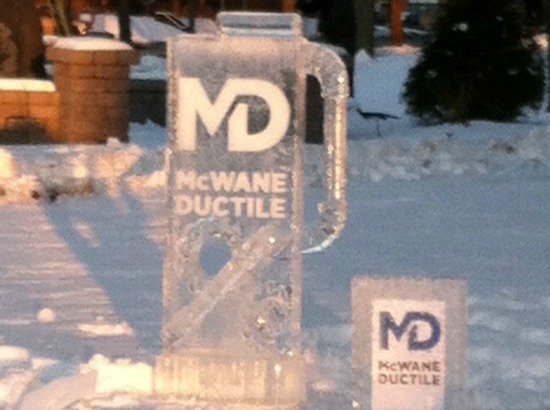 We are proud to report that McWane Ductile Ohio has now been memorialized in ice, which is appropriate in view of the harsh winter we have been having in 2015. Posted on February 25, 2015, in Community Activities of Interest, Community Involvement & Giving and tagged chili, cook-off, Coshocton, ice, McWane, McWane Ductile, McWane Ductile Ohio, Ohio, sculpture. Bookmark the permalink. Comments Off on McWane Ductile Ohio Sponsors Ice Carving Festival.